Here are some ideas on how to throw the perfect little pumpkin party for a Halloween baby shower. At first glance, Halloween and baby showers don't go very well together. The freaky costumes, the gory monsters, creepy spiders, and the whole celebration of the dead thing doesn't quite fit with the cute, delicate and sweet ambiance of a baby shower. So, what can you do for a cute, baby-related Fall / Halloween baby shower? One of the cutest ideas is to throw a Little Pumpkin Baby Shower. You could call it: "Mommy's Little Pumpkin" or "Sarah's Little Pumpkin" (the mother's name), or "A Cute Lil' Pumpkin" or something like that. This is a great baby shower theme for September, October, or November babies. There are so many cute pumpkin ideas which make this theme quite simple to put together. Especially since there is such a huge supply of pumpkin decor & party items in all the stores around this time of year. If you are up to making your own invitations, here is a fun, crafty idea for a Pumpkin or Halloween Baby Shower Invitation. You will need two shades of orange paper, some green (gros grain) ribbon, some scissors, a hole punch and a black pen. Take one of your orange papers (the one that will be the main pumpkin color) and fold it in half the long ways. You can probably get two invitations from one sheet of paper, depending on how big you make them. Now, starting at the fold, which will be the top of the invitation, draw with a pencil the shape of a pumpkin. (In my example, I used a more square shape to look more contemporary). You could use a pumpkin cookie cutter to trace the pumpkin shape with. The invitation will fold open at the top. Now when you get a shape that you like, cut it out with your scissors. You will be cutting both the front and back out at the same time. Next, take your hole punch and punch out one hole close to the top. Take about 6-7 inches of ribbon and fold it in half. Put the folded end of the ribbon through the hole in the card, from the front and pull it through to the back. Now, loop the loose ends of the ribbon through the folded end of the ribbon, and cinch tight. That will be the stem of your "pumpkin". Then, if you want you can outline the pumpkin edge with a black pen (as seen in the picture). 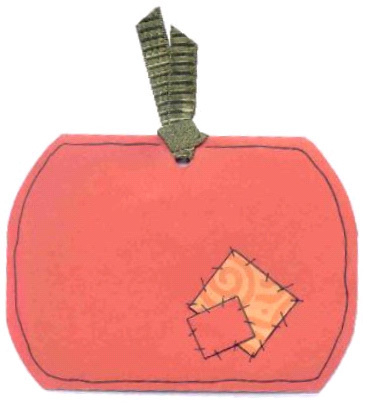 And if you like, you can cut two small squares of orange paper, one of each color of paper and make two patches. Tape or glue them on and then draw stitches on them with your black pen (as shown in the photo). That's it! You can either write the pumpkin baby shower details on the inside or print the details out on white paper, cut it out in a square that will fit inside the invitation and tape it to the inside. If you don't have the time to make your own invitations, you can use this free printable pumpkin halloween baby shower invitation below, and print them out RIGHT NOW! For a Pumpkin Halloween Baby Shower Centerpiece, buy a small to medium-size pumpkin. Cut out the top, and buy a bouquet of orange, yellow, and red flowers and place in the pumpkin. You will have a beautiful fall colored pumpkin baby shower centerpiece! To mix a little baby into the Pumpkin Halloween baby shower decorations, you could buy some orange and light blue (for boy) or light pink (for girl) balloons and fill them up with helium. Then scatter them across the party room. You could also do this with streamers. Buy an orange roll and a blue or pink roll and put them up in your party room. Buy miniature pumpkins and place them in groups of 3 around the party room. Set one on top of the other two, or you could buy a little 4 inch long miniature bail of hay at a craft store and set one or two pumpkins on top the the hay. There are many Halloween decorations in party stores that would be great for a Pumpkin Halloween baby shower theme. Like pumpkin garland, pumpkin plates & napkins, pumpkin table cloths etc. What you need for this pumpkin activity: One onesie for each group or individual. Buy large packs of white Gerber onesies at the store. Buy non-toxic paints and/or markers, be sure to get orange and green. What you need for this pumpkin game: One pumpkin for each group. You will also need to have enough carving knives for each group. Prepare a place where everyone can carve their pumpkins; be sure to have plastic sacks or newspapers laid out for the mess. How to play this pumpkin activity: Split the guests into groups of 3 and give them a pumpkin and a carving knife. Tell each group that they must carve out of the pumpkin something that a baby does. This is kind of hard! They could carve a crying baby, a smiling baby, a baby drinking from a bottle, a messy diaper, etc. Give the guests plenty of time for this (15-20 minutes). Have a grand showing of all the pumpkins at the end. Turn out the lights, light a tealight candle and place it in each pumpkin and let the guests ooh and ahh. The expectant mother judges whose pumpkin is the best, and that group gets a prize! This is a meaningful Halloween baby shower activity for the expectant mother. 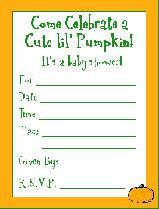 Each guest will get one of these cards ( click here and print out one pumpkin baby shower card for each guest) and will write down a fun memory, some motherly advice or something special that their mother did which made them feel like they were "Mommy's Lil' Pumpkin". For Pumpkin or Halloween baby shower Prizes, you could have pumpkin M&M's, pumpkin scented lotion, or pumpkin scented candles. There is a plethora of pumpkin entrees, desserts and sides that you could make for the pumpkin Halloween baby shower party. I have listed below some of the tastier ones! In a mixing bowl, combine pumpkin, sugar, oil and egg. Stir baking soda into milk and let dissolve; stir into pumpkin mixture. In a separate bowl, sift together flour, baking powder, pumpkin pie spice, cinnamon and salt. Add flour mixture to pumpkin mixture and mix well. Add vanilla, chocolate chips and nuts. Drop by spoonful onto a greased cookie sheet and bake at 350° for approximately 10 minutes or until lightly brown and firm. Beat eggs and sugar together. Add pumpkin and lemon juice and mix together. In a separate bowl sift together flour, baking powder, spices and salt. Fold into pumpkin mixture. Line a 15x10½x1-inch jelly roll pan with waxed paper. Grease lightly. Spread pumpkin mixture evenly in pan. Bake at 375° for about 15 minutes or until lightly browned. Turn out immediately onto a clean dishtowel sprinkled with powdered sugar, removing the waxed paper. Sprinkle more powdered sugar on top of cake. Start at one end, carefully rolling towel and cake together. Cool on countertop. Combine the 1 cup powdered sugar, cream cheese, butter and vanilla. Beat until smooth. Gently unroll cake onto cutting board, removing towel. Spread cream cheese filling over top. Sprinkle with pecans. Roll back up. Cover with waxed paper and chill in refrigerator. Best when made a day ahead. Will keep in refrigerator 6-10 days (well-wrapped). Freezes well. Makes 12 servings. Wash seeds thoroughly in a colander and put on paper towels to dry. Place seeds in a skillet with butter and salt. Cook and stir until all seeds are well-coated with butter. Bake in a shallow baking pan for about 30-45 minutes in a 250° oven. In a large microwave-safe bowl, combine the pumpkin, marshmallows and chips. Microwave, uncovered, on high for 1-½ minutes; stir. Microwave 30-45 seconds longer or until marshmallows are melted and mixture is smooth, stirring every 15 seconds. Cool to room temperature, stirring several times. Set aside about 1 tablespoon of whipped topping. Fold remaining topping into pumpkin mixture. Spoon into crust. Garnish with reserved topping and miniature chips if desired. Refrigerate for at least 2 hours before slicing. Yield: 6-8 servings Note: This recipe was tested in an 850-watt microwave. Melt butterscotch chips in a small saucepan over low heat, stirring constantly (or melt in a double-boiler). Remove from heat and cool to room temperature. In a medium mixing bowl, combine the flour, sugar, baking powder, cinnamon, salt and nutmeg. In a separate large mixing bowl, mix together the melted butterscotch chips, pumpkin, oil, eggs and vanilla with a wire whisk. Stir in flour mixture. Spoon batter into a well-greased and lightly-floured 10-inch Bundt pan. Bake at 350° for 40-50 minutes. Cool in pan on wire rack for 30 minutes. Dump out cake onto desired serving tray and cool completely on wire rack. Serve individual slices with Butterscotch Sauce. In a heavy-duty saucepan, heat evaporated milk over medium heat just until boiling; remove from heat. Add 2/3 c. butterscotch chips and stir until smooth. Return to heat and stir constantly while bringing sauce just to a boil. Remove from heat and cool to room temperature. Stir again before serving. Drizzle over sliced cake. In a heavy stock pot, sauté bacon. Drain and crumble bacon; set aside. Add oil, onion, carrots and celery to pot. Sauté until vegetables begin to soften (about 20 minutes). Stir in chicken stock, pumpkin, sugar, thyme and bacon. Bring to a boil. Reduce heat and simmer until vegetables are tender (about 20 minutes). Let soup cool some, then puree in batches in a blender. Return soup to pot. Mix in half & half, nutmeg and curry powder. Stir in additional stock if soup is too thick. Season with salt and pepper. Sprinkle cheese on top of each bowl when serving. Note: If soup is too hot when pureeing, it will explode out of the blender! Some of the best favors I've ever had have been edible ones. So a delicious idea for a Pumpkin or Halloween Baby Shower would be to make each guest a small plate of the Pumpkin Chocolate Chip Cookies or the Frosted Pumpkin Muffins above and attach a little note that says, "Thanks for celebrating our little pumpkin", or "Thanks for coming to our Pumpkin Party! ", or something else related to pumpkins. In the Fall time, there are many varieties and brands of pumpkin-scented soaps and lotions. You could buy each guest a small bottle of pumpkin hand soap or body lotion or to pamper themselves with. Burning a warm scented candle is the perfect way to usher in the Fall, so another Pumpkin Halloween baby shower favor idea is to give each guest a small pumpkin scented candle. A Halloween baby shower can be a lot of fun and hopefully these ideas will help you! Best Wishes on your Pumpkin or Halloween Baby Shower!